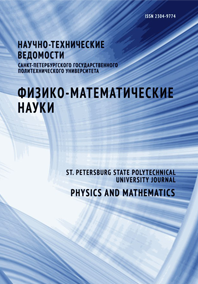 Ivanishchev Dmitry A. Kotov Dmitry O. Ryabov Victor G. Ryabov Yuri G. Samsonov Vladimir M. Berdnikov Yaroslav A.
Phi-meson resulting spectra and nuclear modification factors measured in (p + p)-, (Cu + Cu)- and (Au + Au)-collisions at = 62,4 GeV have been presented. Neither suppression, nor enhancement of phi-meson yields in (Cu + Cu)- and (Au +Au)-collisions was observed. Recombination models were shown to be a promising instrument for understanding hadron production mechanisms at intermediate transverse momentum region both at = 62,4 and 200 GeV.